“A truly fine vista.” he said to himself. Behind him, the road up to the observatory lay bare apart from a few strands of snow crossing whatever was left of the gravel. The spike of the observatory’s weather station tower loomed in the distance. The endless northern dusk ploughed on towards nightfall. “For a mountain hike that’s nothing!” he said as a gust of freezing air hit him smack in the face. What could one do? It was October at 69 degrees north. It was cold. Overall, he did not regret his decision to leave Andrew to drive up alone later if he really had to. Walking in the crisp air was not just healthy but beautiful. A big fat, lentil-shaped cloud sat on the lee-side of the mountain. Behind it, the sky glowed pink and blue. One ridge of mountains, in the middle of the ocean. Steady winds from one side and a geometry in the mountainside, which encouraged nature to produce mountain waves. The mountain waves then created beautiful lenticular or fishbone clouds, at least sometimes. It still fascinated him that the wind did not push the cloud, but seemed to flow right through it. This place was simply perfect to do science! The Norwegians had even built a road up a steep mountainside, with no viewpoint or anything at the top, just a scientific observatory. Just a scientific observatory? What a stupid way to think about things. In his own research, he used water molecules as a tracer to see the mountain waves even when they did not produce clouds. If you pointed a laser upwards, you could still find out where there was water. 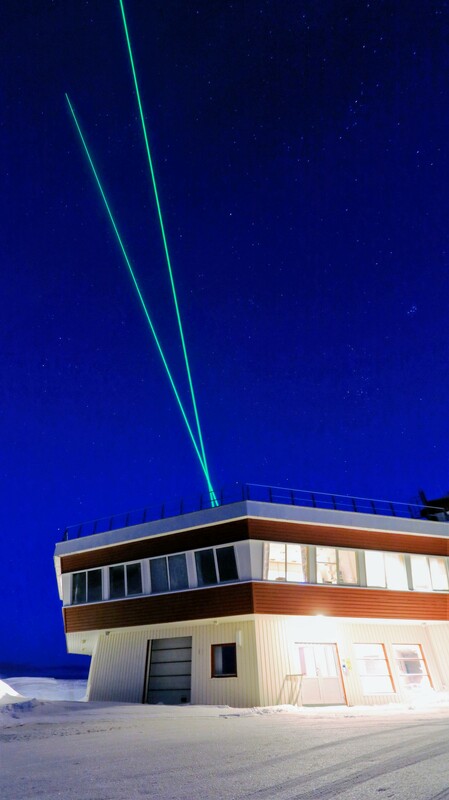 You could make the places where a cloud could soon build up visible with a laser. He looked up to the observatory. You could not really see the lasers, no. What you saw were the actual molecules in the air, taking in the lasers’ light, and then sending it out again in all directions. He felt goose bumps building up on his skin. Perhaps it was the cold. Perhaps it was the fact that humans could build stuff like this, lasers, and do stuff like this, make molecules in the air visible to the naked eye. Out of nowhere, a car appeared below him and raced up the hill. He got rid of his thoughts just in time to take a controlled step to the side and let it pass. That had probably been Andrew, he thought, the little rascal. He shivered. The draught from the passing car had been freezing. He noticed how the wind picked up even more strength. His smile froze. No more rascals, just wind now. “Probably gonna be great measurements today.” he said, cheering himself up and watching his breath condense into a little cloud in front of him. He heard barking. A dog – and its owner – came downwards from the observatory. This fascinated him to no end. People at home never walked along roads they could drive on. If you had a dog back home, you would take it to the woods in your car and then run around on paths that no car could pass. However, this was Norway. People did things differently here. After all, he himself had insisted on walking up the mountain for no other reason than, once back home, to say that he had been on a mountain hike. He felt less of a bad conscience about this than he had anticipated. Walking up that road was tougher than expected. Still, this was a road he walked on. The greatest challenge on the way up were those icy patches, which closely resembled the frictionless tilted planes of school physics. They shone in the ever darker light and, were, as it were, easy to circumnavigate, but the darkness engulfed him more and more such that he started focusing on every step he took. To no avail. He did not see that one icy patch. He stepped on it and started slipping. At the same moment, a wind gust hit him square in the face, and upper body. He felt like one weird scrambled egg as he lay on the floor. His head pointed downwards along the slope. He had no recollection of how his body had turned. Parts of it burned with pain. Other parts felt the cold stinging even more. The man stopped beside him. The dog sniffed at him, licked his face. The man just straight up laughed. “Var det litt glatt?” the man asked as he heaved him up. The dog waggled its tail, still trying to lick at his face. “Sorry?” he said, brushing pieces of rubble and ice of his coat. “You’re not from here, I can see that.” the man said. He stood there, listening to this outpour of words, processing it bit for bit. Previous Sure. It’s out of focus.